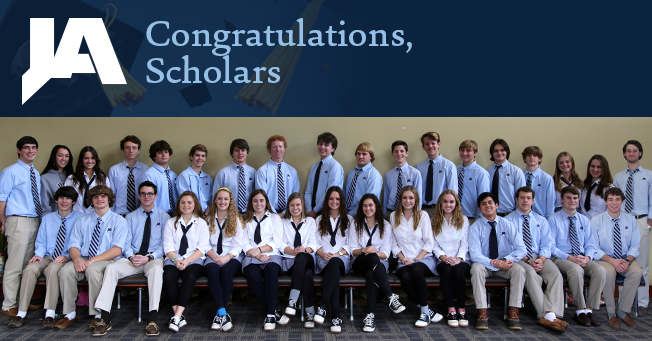 Jackson Academy junior and seniors who have scored 29 or above on the National ACT include the following pictured above: (from left, back) Zach DePriest, Rebecca Nosef, Caroline Duncan, William Bell, Chandler Sessums, Hayden Berry, Davis Rippee, Matt Whitfield, Kyle Kantor, Thad Scott, Dalton Gibson, Tyler McClellan, Cory Tirman, Gavin Funderburg, Brennan Canton, Hannah McCowan, Amanda Ray, Ray Edward Stevens (front) Will Varner, Wyatt Powell, Will Tribble, Mary Brooks Thigpen, Elizabeth Burford, Robyn Hadden, Georgia Gibson, Danielle Hodges, Hannah Jane LeDuff, Maris Hardee, Tori Roberts, Anderson Helton, Jake Manning, Grady Fisher, and Gordon Campbell. Not pictured: Curt Knight. Students who have scored a minimum of 29 on the National ACT are eligible for the Mississippi Eminent Scholars Grant, a $2500 per year grant awarded to in-state residents pursuing their first degree at an approved postsecondary institution in Mississippi. Recipients of the grant also must have maintained a high school cumulative grade point average of 3.50 on a 4.0 scale. JA is known for establishing high expectations for students by creating a school culture that identifies and communicates the need for all students to meet or exceed ACT College Readiness Benchmark Scores. The school engages students in early college and career awareness, helps students set high aspirations, and ensures that they plan a rigorous Upper School course load. This year JA has offered a yearlong elective that focuses on PSAT/SAT and ACT skills for sophomores and juniors. All sophomores and juniors are encouraged to consider the class. For those who cannot work the elective into their school day because of a full course load, JA offers a PSAT workshop for juniors before school.